Eddy Ray Makes Events Magical & Memorable! Ready To Make Your Party Magical? Contact Eddy Now for Availability and to Schedule! I’m very excited that you’ve found my web site. Please select the type of event that you are interested in by using the Quick Access Links below. If you are searching for detailed info on a kids party, browse around my site for all the details. I’ve designed my site to make it easy for my clients to find the information they are looking for and to make a well informed decision about hiring ANY magician for their event. Enjoy! For A Free Quote And Information Now! When hiring a magician in Myerstown it’s important to consider several things before deciding upon the right magician for your event. Here are some insider tips to help you when hiring magicians in Myerstown. a) Myerstown magicians are not all professional. Most magicians in Myerstown perform in their spare time which is fine but you can’t always rely on an amateur to give a professional service and entertaining magic show. It’s important to seek out a professional just as you would for any other service. Eddy Ray is a professional magician in Myerstown and offers memorable magic shows at an affordable price. b) Are there any certified magicians in Myerstown? Eddy Ray is the only certified magician in Myerstown currently. He received certification for providing excellent service and professional magic shows for both kids and adults. You can view the certifiation for this magician in Myerstown here. Pennsylvania Magicians Reviewed. When you hire a certified professional magician you know that you are getting the best of the best, they will be reliable, and you will get the most value. c) Does the magician in Myerstown offer a satisfaction guarantee? A guarantee shows confidence in the service or product. 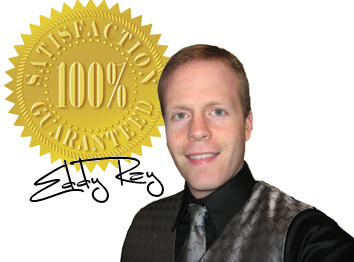 Eddy Ray is the only magician in Myerstown who offers a 100% satisfaction guarantee. He guarantees his audience will be smiling, laughing, and having a good time or the show is free. How fair is that? If interested in more information on this magician in Myerstown, please call Eddy Ray at 1-877-297-7252. PA's Busiest Magician Eddy Ray offers family friendly magic for parties and events! PA Magician For Kids and Adults has unique magic show solutions from stand-up performance to close-up street magic that will entertain and delight. 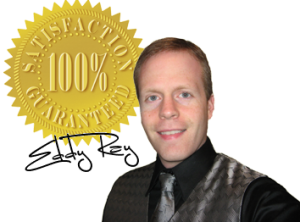 PA Magicians Reviewed to read more customer reviews on the #1 Magician in PA, Eddy Ray. Find the best Children's Magic Shows For Kids Birthday Parties Eddy Ray.